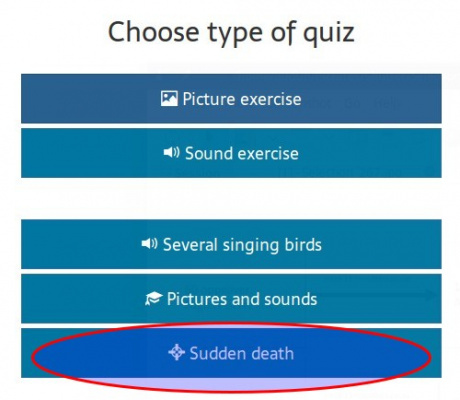 Sudden Death is a quiz that makes use of all our media that is rated as too difficult for the regular quizes. It starts off with media from level 3 and 4, and then moves on to higher difficulties. This quiz is much harder than the exam, so don't be intimidated if you are practising for that! Suddden Death includes all vagrant/accidentals of the whole Western Palearctic, even those recorded only once. About every tenth question will be a sound, the rest are images. By solving many questions right you aquire extra lives, but only a maximum of 3 in total.